The Sisters of Charity Foundation of Cleveland is one of several local philanthropic organizations providing initial support to Lead Safe Cleveland, a coalition organized to prevent lead poisoning in Cleveland. With more than two decades of focus on the social determinants of health, as well as finding the best ways to provide safe and stable housing, SOCF is an essential partner in this work. SOCF and other funders will work closely with the City of Cleveland, as well as longtime partners like Enterprise Community Partners, to understand the scope of Cleveland’s lead problem and develop remedies and goals for the future. For more on Lead Safe Cleveland, including its five-point action plan, read the below press release from the City of Cleveland. CLEVELAND – Mayor Frank G. Jackson, Council President Kevin J. Kelley, Councilman Blaine Griffin, Mt. Sinai Health Care Foundation President Mitchell Balk, and Environmental Health Watch Executive Director Kim Foreman and more than two dozen partners today announced, Lead Safe Cleveland, a local coalition to address lead poisoning. The coalition unveiled a five-point action plan and invited the community to join the dozens of major local organizations already committed to the work. There is no safe blood level of lead. In a recent Case Western Reserve University Study, data showed that 93.5 percent of children tested had some exposure to lead, which at even low levels can damage a developing brain and cause lifelong problems with education, behavior, and health. Lead Safe Cleveland will pursue a comprehensive, sustainable, and preventive approach that merges: smart, adaptable public policies and legislation; knowledgeable agencies willing to collaborate; proven community programs; and public and private sector accountability. Lead Safe Cleveland does not require that all homes be free from lead, but rather allows for the use of regularly maintained interim controls, or safety measures to protect children from lead exposure. 1) Garner public input and establish a community-wide goal and timeline. 2) Introduce legislation. 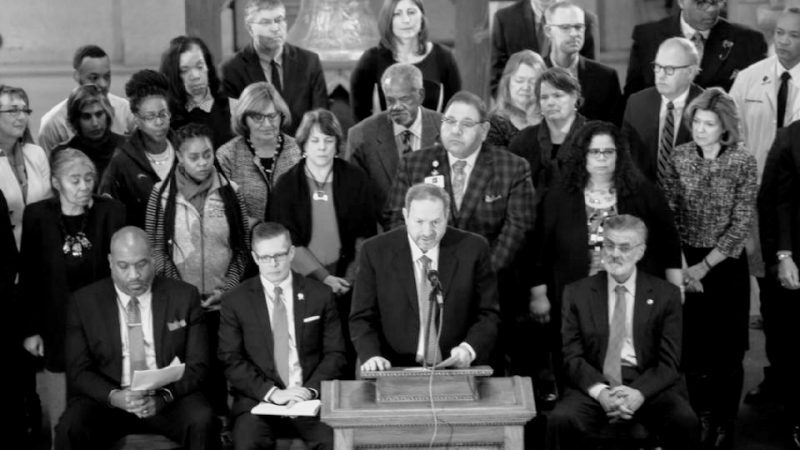 As Chair of Cleveland City Council’s Health and Human Services Committee, Councilman Griffin –in partnership with Lead Safe Cleveland –is creating comprehensive legislation that covers four key areas: Prevention; Screening of Children; Treatments and Interventions; and Education and Outreach. It will lead to an overall rework of city ordinance Chapter 240 with input from the coalition. 3) Host the Cleveland Lead Safe Summit. The Summit is an opportunity to learn more from experts and peer cities, but more importantly, an opportunity for Cleveland to convene and work on a lead safe solution. Cleveland will welcome national experts, landlords, media, advocates, community members, elected officials, and others. The Summit will elevate resident stories, hear the challenges of landlords, and address tenant rights and workforce development. 4) Create a Cleveland Lead Safe Home Fund. Lead Safe Cleveland will model a Lead Safe Home Fund and explore its capitalization. In order to create a Lead Safe Home Fund, the Coalition will leave no funding source unexplored. 5) Advocate for state and federal support. Lead Safe Cleveland is encouraged by Governor’s DeWine’s platform, prioritizing childhood initiatives. The Coalition hopes to partner directly with him and his administration, as well as garner federal support. Cleveland’s lead safe solution. Under Mayor Jackson’s leadership, the City has operated the Healthy Homes Interdepartmental Initiative since 2016, which includes representatives across city departments, working together to dissolve operational silos and collaboratively tackle lead poisoning. The city has since launched Accella portal as a way for citizens to look up lead status and housing code violations of properties. Building and Housing has hired new staff and revamped its rental registry and inspection process. There have been 59,000 rental units registered and renewed during Mayor Jackson’s term, including randomized lead dust inspections and improved landlord outreach. The Department of Public Health has also increased staffing levels and began placarding homes to warn the public that a child was poisoned in the home, and the home is legally uninhabitable until the lead is remediated. In 2018, City, County, philanthropic, and nonprofit leaders came together around a series of learning exchanges, gathering best practices from across the country. A public-private contingent attended the HUD Healthy Homes Conference in June of this year, followed by a group of nearly 30 local leaders taking part in a peer-to-peer site visit in Rochester, New York, in November. Each stop included in-depth discussions with national lead poisoning prevention experts, including thought leaders from the Robert Wood Johnson Foundation, Pew Charitable Trusts, the National Center for Healthy Housing, and leaders from several major cities.